Instead of cordoning off the sites with crime-scene tape, the scientists are blocking access to the hives using cut lengths of PVC pipe with a slit about midway down. There, a sliding wire-mesh door separates incoming bees from outgoing ones. None of the busy little winged bearers of pollen and nectar will get by without inspection-and for good reason: the researchers suspect the bees are physically harboring their target: an oval-shaped, pinhead-sized parasite called the Varroa mite. 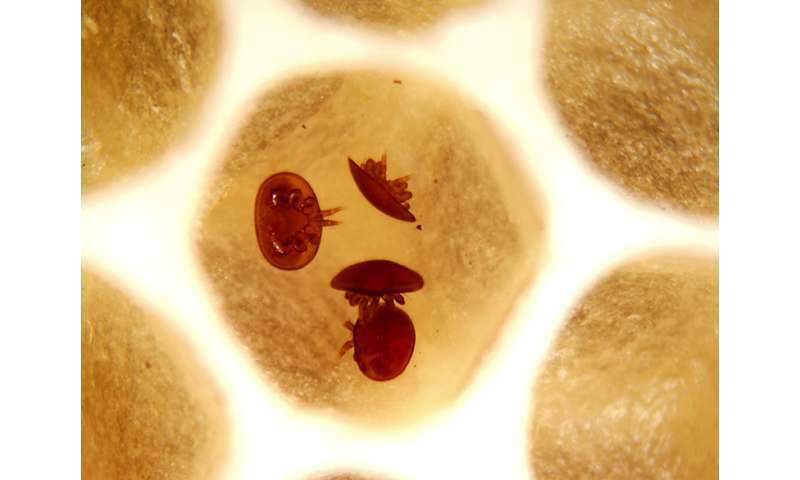 The Varroa mite is public enemy number one to not only honey bees nationwide, but also the 90-plus flowering crops that depend on the insects to pollinate them, including apples, almonds, blueberries and cantaloupe. The team's investigations in Bismarck this June are actually a follow-up study to the one they completed last year at two Arizona sites. Findings from that study suggest that bees can bolster their hives' existing mite population by carrying in Varroas from other colonies-an influx that most often occurs in the fall, especially November. Varroa populations grow slowly because females produce only three to five offspring. If mite populations in colonies are low, then they should remain that way for at least a season before chemicals called "miticides" need to be applied, explains DeGrandi-Hoffman, who leads ARS's Carl Hayden Bee Research Center in Tucson. Sometimes, though, Varroa numbers soar to potentially hive-wrecking levels during the fall. To the researchers, this suggested that factors other than mite reproduction were involved-namely, "mite migration" via foraging bees and wayward "drifters" from other colonies. At the Arizona hive sites, this influx of migrating mites correlated to population increases of 227 to 336 percent, starting in November. The findings appeared in the February 2016 issue of Experimental and Applied Acarology. In addition to further investigation at a Bismarck apiary, the researchers will also evaluate placing hives in refrigerated storage in the fall to head off mite migration into colonies. 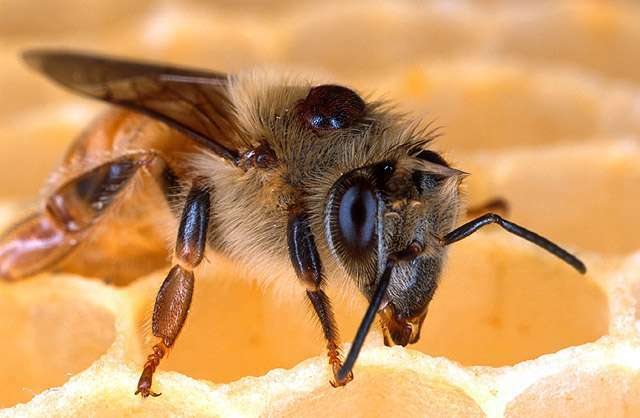 They'll determine the strategy's effectiveness based on whether it reduces the need for miticide applications, keeps Varroa populations low and results in high winter survival rates for colony members.